As part of the effort of contribute significantly to the growth of value added product in Nigeria, 3T Impex has commenced the sale of a very fine looking and lovely blank stand-up pouch in Nigeria. 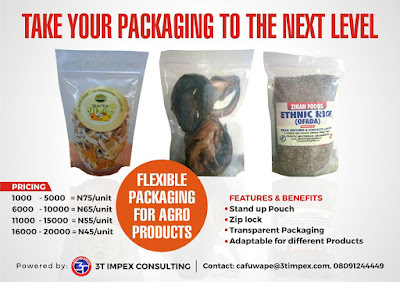 The stand-up pouch is plain, has a zip lock, it is transparent and it can be adapted for the packaging of different products in Nigeria. This initiative was borne out of the realisation that most product, even though they are of good quality, could get good buyers in the export market because of their failure to meet the standard of packaging required abroad. We have therefore come up with this idea of selling the standup pouch to both our clients and other Agro processors in Nigeria who will like to see their products in a well designed pack. The beauty of this initiative is that the Agro processor simply buy the stand up pouch and affix its labels in front and at the back. The details of labeling expected at the back especially for food products include: name of the product, brand name, weight, nutritional value, constituents, bar code, batch number and expiry date. For those who are interested in seeing a sample of the pouch look like, you can visit our facebook page. Exportation is a major foreign exchange earner for any economy in the world, but it has to involve multiple products for it to be sustainable. In Nigeria for example, the major foreign exchange earner is the exportation of crude oil and gas with both constituting more than 90% of the exportation from Nigeria. Despite the huge prospect that the exportation of other products (like Agricultural products and Solid minerals) presents, the challenges in the export business has prevented the country from realising the export potentials in these other sectors. According to the world top export, the total export volume from Nigeria in 2016 was $34.9B and the top ten items exported from Nigeria in the same period include Crude Oil - $31.9B, Cocoa -$899.1M, Wood -$279.4M, Oil seeds -$279.2M, Hides and Skin -$216.7M, Raw Minerals -$169M, Aluminium -$134.9M, Copper $109.8M, Fish -$102.7, Fruits & Nuts -$65.6M. Apart from Crude Oil on this list, six of the items exported are Agricultural products, while the remaining three are solid minerals. The fact that this volume of exportation of Agricultural products was done despite the shortcomings (huge post-harvest loss, over 70% being peasant farmers and less than 50% of the arable land are under cultivated) in this sector, is a pointer to the fact that we can do a lot more exportation from this sector. The world export data showed that there is a huge potential for increase of the Nigerian market share. This can be seen in the very wide gap between the volume of the top items of export from Nigeria and the world export volume of the same products. For example, in 2015, Nigeria exported Cocoa products worth $504M while the volume of Cocoa traded globally was about $9.5 in 2015. For Oil seeds like Sesame seeds, Nigeria exported $290M worth of this commodity in 2015 while the world traded volume in the same year was about $2.91B. Another potential foreign exchange earner that is not on this list is Cashew nut. In 2015, Nigeria exported Raw Cashew nuts that was worth $152M while the world traded volume of this product in the same was $6.1B. A product like wood charcoal generated an export inflow of about $38.5M for Nigeria in 2015 while the world traded volume in the same year was $1.08B. On the other hand, we have huge potentials yet to be tapped from the exportation of solid minerals. In 2015, Nigeria was only able to export lead ore that is worth only $16.2M whereas the total volume traded in the world in the same year was $5.96B. 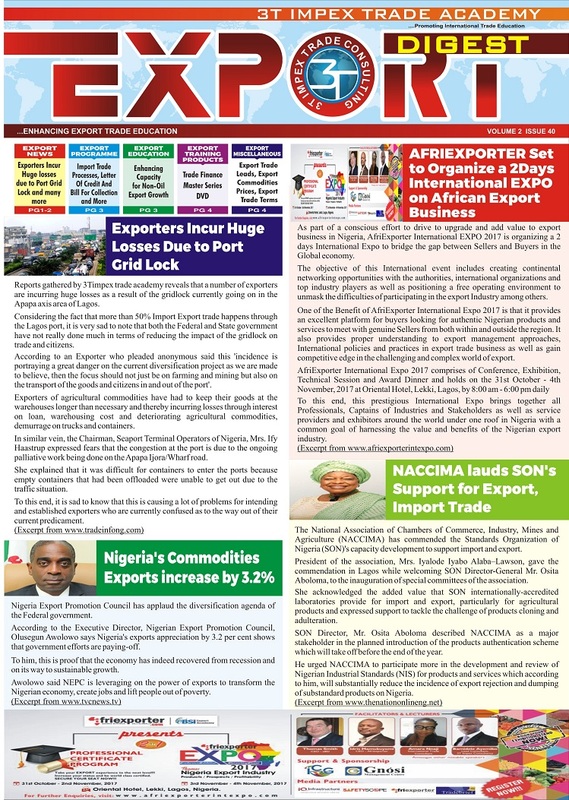 These huge potential will remain at the level of potential if the myriads of challenges confronting export businesses in Nigeria are not resolved. These challenges revolves around Products, Pricing, Purchasers, Paperwork, Payment, Promotion and Policies. These are hydra-headed problems that militates against export growth not just in Nigeria but also in any nation of the world. I will attempt to summarise the issues around each problem in this article. The challenge of product is in two parts, on one hand it has to do with the quality of product being exported, and on the other hand is the focus on only exportation of primary products. The quality issues are mainly due to knowledge gap on the part of Exporters, dubious practices among exporters and local suppliers, inadequate quality inspection agents, inadequate laboratories for testing and sometimes unprofessional and dubious inspection agents. All these hinders the exporters from getting paid after shipment and this makes them to be discouraged and halt further shipments. The focus on the exportation of primary products also reduce our foreign exchange earnings, because the more the value addition to the product, the more buyers are willing to pay. 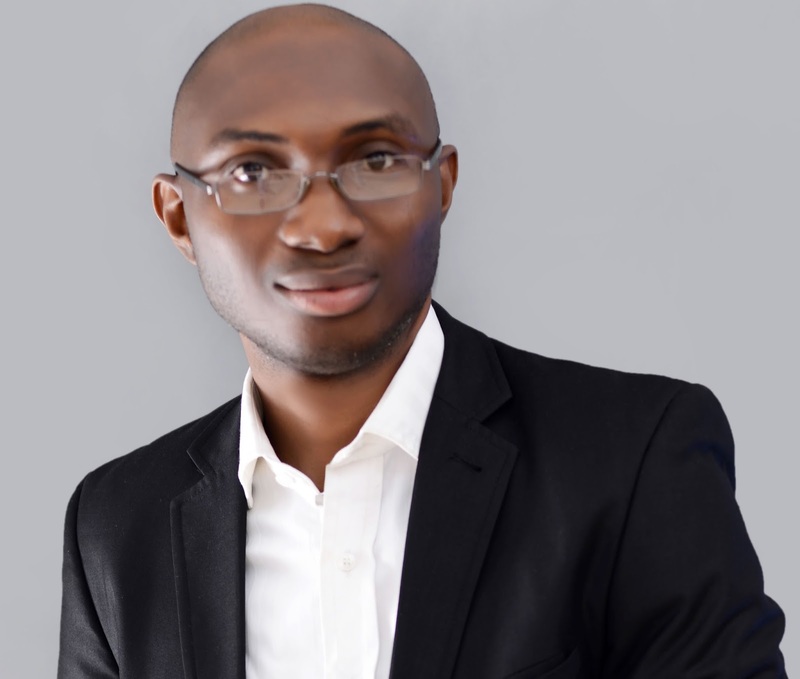 The problem of pricing is majorly due to the high cost of doing business in Nigeria, which is a direct result of the huge deficit in the infrastructure especially the very poor road network, inefficient railway system, inadequate power supply etc. Also contributing to the high cost of exportable commodities is the high exchange rate of Dollar to Naira. This should have been a good news for export but due lack of price control in the local market, the farmers and middlemen increase their commodity prices in line with the increase in the foreign exchange rates in the parallel market. Purchasers is another important factor that hinders the export business growth. This is mainly due to the bad image created by either lack of credibility, (which result from inconsistency) or lack of competence to the deliver the right quality on time and in line with the sales contract. These two factors makes getting buyers a herculean task. The importance of Paperwork in international trade cannot be over emphasised. The buyer is likely going to pay for the goods sometimes before receiving it. The documentation is what gives the buyer the comfort that the goods has been shipped and also that it is the right quality and quantity. 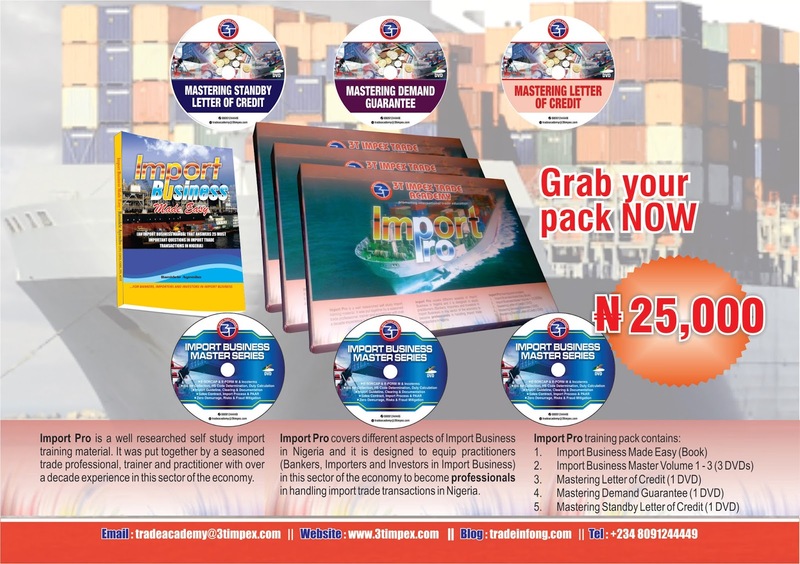 Depending on the nature of the product and the degree of processing involve, there could be international certification or licensing that will qualify the product for sales in the export market. These can be very expensive and involve a rigorous and bureaucratic processes that discourage a number of Exporters. Payment is another very critical challenge that discourage exporters especially the new entrants in the business. The fact that over 80% of world trades are done on Open Account (shipping goods to the buyer and waiting for payment after the buyer must have cleared and sold the goods), which invariably increase the risk of non-payment after shipment makes many exporters to either reduce the volume they ship per time or avoid doing the transaction altogether. The cost of Promotion, a critical elements in marketing a product abroad, is too high for many SMEs to bear. This is because it involves traveling to the targeted export markets abroad to promote the products at trade shows, fairs, conferences etc. Inability to do will mean you have to use the online channels which is less costly but more risky because of the difficulty in confirming the genuineness of the intending buyers on the online trade portals. On a final note, I will like to say that, to resolve all these problems, there is need for practical training (in all the critical areas highlighted above) of the intending and existing Exporters on one hand and a Public-Private Partnership Arrangement on the other hand. The government has to work with the private sector to come up with policies and support to address these challenges and do everything possible to ensure that there is strict adherence to these policies through enforcement. Some of these policies include an export growth desk in the presidency to fund and drive a well articulated promotional strategies. A completely tax free regime should be given to company that add value to their products and export them. 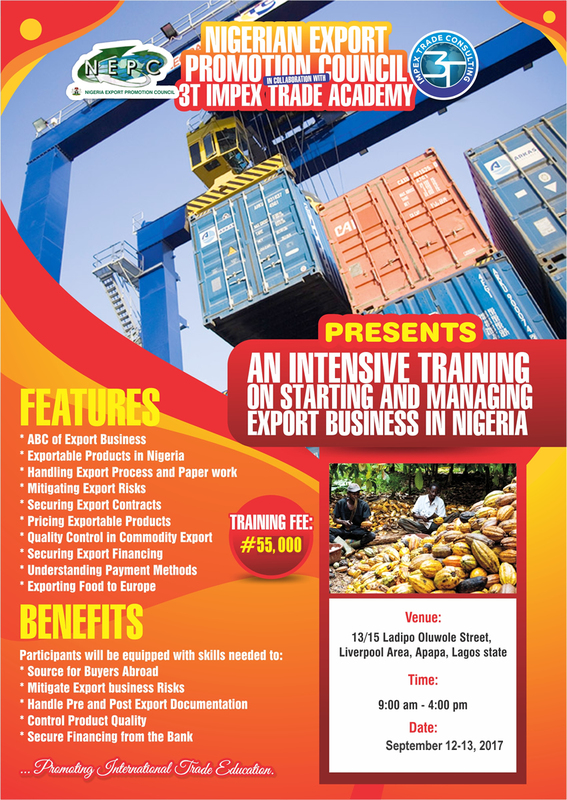 A quarterly intensive training that will last for one week should be organise free of charge only for those that have already started production of their products to build their capacity, connect them with sources of funds and potential buyers in the export market. A committee should be setup that will review the progress made on a monthly basis, address the challenges and report to the export growth desk in the presidency through the Nigeria Export Promotion Council. In conclusion, if these two tools (practical training and relevant policies) are adequately deployed, Nigeria will soon convert her export potentials into actual benefits, which means a massive increase in the foreign exchange earned via non-oil exportation from the country. Reports gathered by 3Timpex trade academy reveals that a number of exporters are incurring huge losses as a result of the gridlock currently going on in the Apapa axis area of Lagos. Considering the fact that more than 50% Import Export trade happens through the Lagos port, it is very sad to note that both the Federal and State government have not really done much in terms of reducing the impact of the gridlock on trade and citizens. According to an Exporter who pleaded anonymous said this ‘incidence is portraying a great danger on the current diversification project as we are made to believe, then the focus should not just be on farming and mining but also on the transport of the goods and citizens in and out of the port’. Exporters of agricultural commodities have had to keep their goods at the warehouses longer than necessary and thereby incurring losses through interest on loan, warehousing cost and deteriorating agricultural commodities, demurrage on trucks and containers. 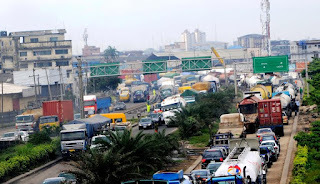 In similar vein, the Chairman, Seaport Terminal Operators of Nigeria, Mrs. Ify Haastrup expressed fears that the congestion at the port is due to the ongoing palliative work being done on the Apapa Ijora/Wharf road. She explained that it was difficult for containers to enter the ports because empty containers that had been offloaded were unable to get out due to the traffic situation. To this end, it is sad to know that this is causing a lot of problems for intending and established exporters who are currently confused as to the way out of their current predicament. In April 12, 2007, the Central Bank of Nigeria (CBN) introduced a new document and terminology into the Import sub-sector of the Nigerian trade environment. 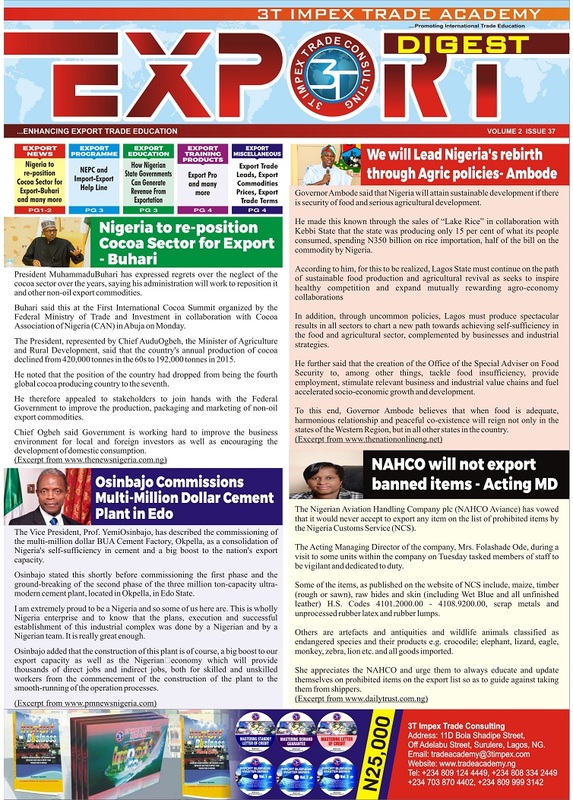 Before this time we only know Form M (application form for Import station in Nigeria, now called e-form m because the process has been automated), NXP form (application form for commercial export), NCX form (application form for non-commercial export) and Form A (application form for invisible trade like payment for offshore services). The newly introduced document has be christened Form Q. This new import process for SMEs portraits a danger to the economy and will also engender corrupt practices. The CBN in its circular dated TED/FEM/FPC/GEN/01/003 and dated April 18, 2017 with the subject: Foreign Exchange Payment for Small Scale Importation. It stated that "the CBN hereby introduces the use of Form Q by Small and Medium Scale Enterprises (SMEs) as part of its effort to improve access to foreign exchange by SMEs. The form has been designed to ease the documentation requirements by these sector." This directive has caused a major confusion in the banking sector, the Customs does not even know how to handle the form and the banks are being penalised for not utilising the funds (as reported in some national dailies). Let me first summarise the Import process in Nigeria to enable you understand the challenges that this Form Q is currently posing to the operators in the sector. To legally Import any item into Nigeria, the importer need to apply online by submitting a pre Import documentations through an Authorised Dealer Bank. This documentations include e-Form, Proforma Invoice, Marine Insurance Certificate and the relevant permit (this depends on the agency of government that regulates the product). The filling of the form is done online (www.trade.gov.ng) and all the relevant documents are attached before submission. This application must be approved before an importer can go ahead to ship the goods into the country. After shipment, the importer will present the original through the sellers bank abroad to the same bank that process e-Form M for approval. The bank will then use these documents to process the Pre-Arrival Assessment Report (PAAR). It is Important to state that these shipping documents include Bill of lading, Invoice, Packing list etc and they must all contain the Form M number. The PAAR and shipping documents are then released to the importer by the bank to enable him clear the goods upon arrival at the port. The PAAR is a document that contains the summary of the shipment and including the duty payable by the Importer. - The importer will most likely be paying incorrect duty since PAAR is not used but rather through an assessment done by customs at the port. This thus encourage corrupt practices that could result in leakage of income due to the government. The implications of all these on the economy include but not limited to the following: increased and easy avenues for corrupt practices, increased and easy avenue for money laundering, depletion and unproductive use of the scarce resources in our foreign reserves and increase avenues for the leakage of the income due to the federal government. In as much as the CBN is doing this with a good intention for the economy, I think that the process was not well thought out. I think CBN is doing this to reduce the pressure exerted by the demand of these categories of importers for foreign exchange (FX) in the parallel market and thereby reducing the rate in the parallel market and bringing some sanity to the FX markets in general. This question is for how long can the CBN do this to defend the Naira? I am of the opinion that the trade-off of this process will be too much for the nation to bear in the long run. The fact that the solutions to our foreign exchange volatility resides in the growth of non-oil export volume in Nigeria is no more a news and neither does it have to be a symposium discussion. This is because the reasons are very obvious before our eyes. Our major foreign exchange earner now is the crude oil export, but we also have great potentials to earn even much more export proceeds from Agricultural and Solid Mineral sectors of the Economy. It is interesting to note that while the total non-oil export volume from Nigeria in 2016 was less than $2 million, the total value of crude oil sold by Nigeria between January and December 2016 dropped by $6.7 billion from $40.5 billion in 2015 to $33.8 billion; a comparative analysis of official crude oil lifting values published by the Nigerian National Petroleum Corporation (NNPC). In my opinion, the reason why the non-oil export volume has been at the low level is simply because there are no supporting drivers in the economy. I discovered the drivers’ gap could really help us increase awareness and encourage a lot of businesses to go into non-oil export business in recent times, when we had shortage of foreign exchange due to the drop in the price and sales of our crude oil. Guess who these drivers are, the Commercial Banks! As the price and sales of oil began to decline and the foreign exchange availability became a mirage, the commercial banks, in the bid to survive and stay afloat, despite the economic recession became suddenly very creative in the drive to generate foreign exchange. They started by training their staff in different areas of export, they set up export desk to take enquiries on exportation, they began to work on export Finance product programmes, they organised Export sensitisation workshop across the country and put together so many more plans and strategies to grow their export customer base. Little did we know that all these were gear towards generate foreign exchange in order to fund their Import transaction, thereby growing their income for business survival and not because they really want to contribute to the growth of the non-oil export sector of the economy. This position of mine has been vindicated now that the foreign exchange has started flowing in a fairly reasonable manner from the CBN. You know what has happened now, most of the commercial banks has reverted back to their default mode of allowing export to be on auto pilot without a driver and concentrating on what brings in the cash- Importation business. Where are the export training for staff? Where are the export sensitisation seminars? Where are the export vibrant desks? Where are the product papers for export financing? Where are all the great and very creative export growth initiatives? They have all gone into oblivion in most of the banks. How I wish the drive and passion of the Nigerian banks for exportation had continued, we would have been far ahead now and even very close to the desired breakthrough in this sector. In order to bring the banks back to continue their drives towards export growth, here are my suggestions. I think the CBN should come up with a foreign exchange allocation mechanism, which allows any bank to get a percentage foreign exchange allocation (that CBN wants to sell per time) that is equivalent to the percentage of the export proceeds received in that banks, based on the exportation done by its customers. For example, if bank A received an export proceeds that amount to 10% of the industry total in the month of January, such a bank should receive only 10% of the foreign exchange allocation to be sold by CBN in the month of February. I expect some bankers to kick against this now because some banks seem to have larger share of the export proceeds inflow because they have more exporters, to solve this the CBN can give a notice of 3months to all the banks ahead of commencement of this policy. This is to enable the banks who currently have low export proceeds to put together their strategies, grow the capacity of their staff and begin the execution of their plans to increase their export customers base. 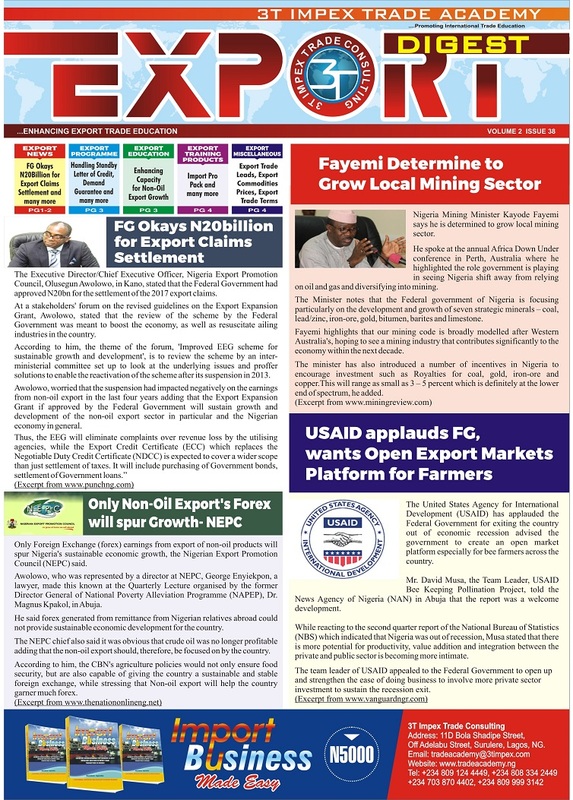 I know that some bankers reading this now might be saying that the Exporters do not declare the details of their export businesses by avoiding the filling of NXP in their pre-export documentation and some might even say that CBN is the one discouraging them by sanctioning them for the offence of non-repatriations of export proceeds committed by the exporters. These are valid concerns and here are my responses to these issues. 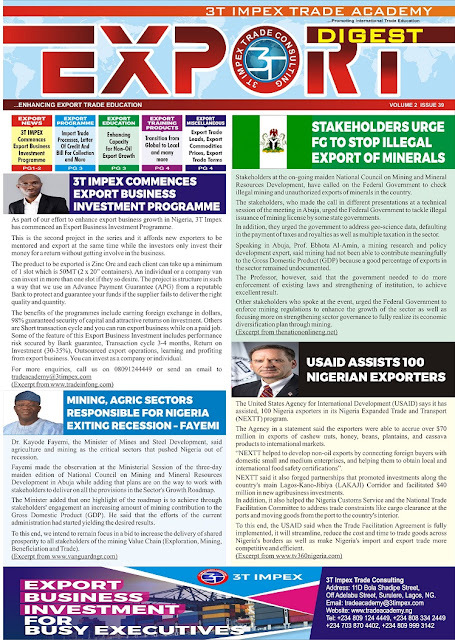 First, I will like to say that the two major initiatives of CBN which include the Investor Exporters window (that enables exporters to sell their export proceeds at a better rate) and the directive that now ensures that all Bill of lading carry the NXP number (so as to ensure that no exporter is able to ship goods out of the country through the seaport without the requisite pre-export documentation) have both solve the problems and remove the fear of the Nigerian banks regarding exporters who avoid documentations done through them. On the other issue of non-repatriation of export proceeds, I will like to recommend that CBN rescind the regulation that says that the commercial bank will be sanctioned for non-repatriation of export proceeds (at least for all, the previous exportation done through them) since, the two new regulations should be able to reasonably cub these practices. The CBN should simply inform the commercial banks to decline any request for further exportation from any company that is into such practices. 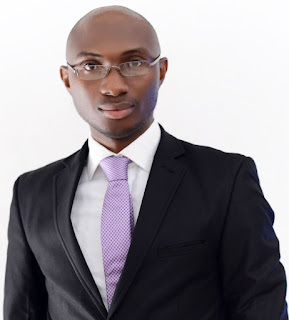 The BVN number of the signatories to such a company's account can be used to by the bank to trace such customers. Finally, it will also be of immense importance to state that the CBN should take the front row in this drive by making good her promise to grow the sector through the approval and release of the Export Stimulation Funds requests that are currently pending before the Governor of the Apex Bank. If indeed we really desire to grow the non-oil export sector in this country, we should not allow it to be on autopilot again, we need to engage drivers who will be committed to championing the course because of what is it for them. 3T Impex Mobile App ............ Learning Trade The Smart Way Click Here To Download the App From Google Play Store. Career Transition is a 1hour, 7mins DVD with remarkable features and benefits to transit from paid employment to being your own boss. One of the features is that it teaches you how to understand the proper definition of work, the place of passion, talent and market as well as the types and levels of money. 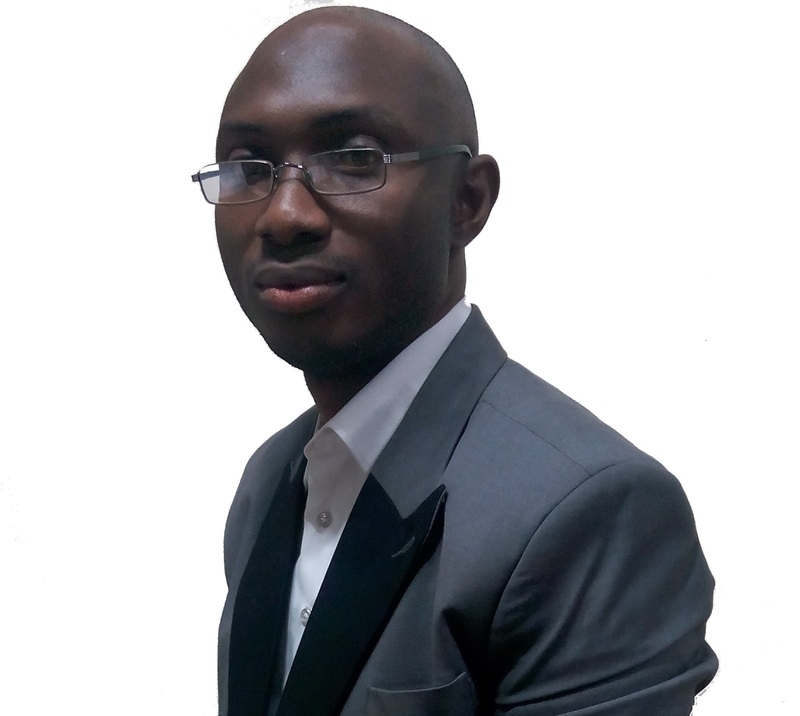 It exposes you the critical phases of a successful career and overcoming the challenges of entrepreneurship. It provides you with the five sources of capital for business take off & growth alongside understanding the vision and core ideology of business. 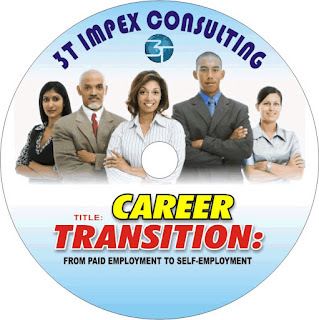 The benefits of the Career Transition DVD is that it helps you know the easy steps to becoming your own boss and seeing great business opportunities around you. Career Transition practically demonstrate how to write a bankable business plan. It prepares you for retirement & retrenchment. It assist you in overcoming the fear of the unknown. It shows how easy it is to access capital as well as ways to handling mistakes and failure in business. Navigate all the hurdles of import processes from sourcing for suppliers to getting cheaper sources of foreign exchange with #ImportPro. It gives practical demonstration on filling your e-form M, getting e-SONCAP, Import Permit, HS Code and Duty Calculation.